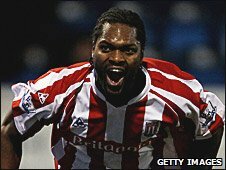 Stoke manager Tony Pulis has admitted he was one of the most surprised men at Fratton Park when Salif Diao scored the winning goal against Portsmouth. The Senegal international midfielder netted his first Premier League goal in over seven years, in the 2-1 victory. Pulis told BBC Radio Stoke: "I couldn't believe he'd got that far forward. "I didn't know he'd scored the goal until I got back in the dressing room. I couldn't believe it, I'll have to watch it on television to believe it." Diao's stoppage-time winner was his first goal in 78 appearances for Stoke, and his first in the top-flight in England since netting the winner for Liverpool in a game against Leeds at Elland Road in October 2002. Pulis believes the 33-year-old, who is out of contract in the summer, can continue to be a key part of the Potters' squad beyond the end of the season. "He's a great lad, I've got a lot of time for Salif, and I hope and pray that we can keep him at the football club," added Pulis, whose side are now undefeated in 10 matches in all competitions. "He's a great ambassador for a lot of African players, they have a lot of respect for him. He's a model professional as well and the type of person that you want to keep." Stoke, along with Aston Villa, are the only two Premier League teams that are yet to lose a match in 2010.